National Human Services Assembly is a membership-driven change agent in the nonprofit human service sector that provides a voice for the human service sector through being member-focused and sector-driven. In a role of member developer, National Assembly focuses on providing members with a robust set of programs, resources, and tools to strengthen organizations and to support the human service experts on staff. It is also committed to driving change in the human service sector through its public policy work and other initiatives. To stimulate shared learning and collaborative action, National Assembly convenes human service sector professionals in multiple national collaborations, initiatives, learning events, group purchasing, and more. Membership with the National Assembly gives organizations a voice and a seat at the table among other national leaders in the human service sector, allowing members to position themselves to be a part of the leading voice in shaping the dialogue and policy in the sector and community. There are two types of membership: Regular and Associate. Regular (Full) Membership: An organization eligible for Regular Membership has all of the following characteristics: it is national in scope, nonprofit, and substantially focused on providing human services. An organization wishing to become a member also supports the mission of the National Assembly, agrees to participate actively in collaborative learning and action efforts (those that are relevant to its own mission and operations), and agrees to pay its membership dues (based on a formula for Regular Members and a sliding scale for Associate Members). The National Human Services Assembly is the only forum focused specifically on the unique needs of the nonprofit human service sector. You don’t want to miss being a part of the National Assembly member network. Learn more about joining. 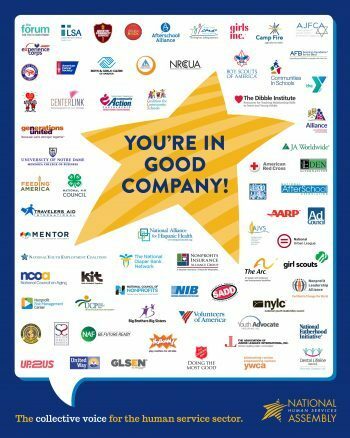 We are proud to have an amazing list of human service organizations that make up our membership. Build public support for human services so that all people have the opportunity to reach their full potential and contribute to thriving communities.